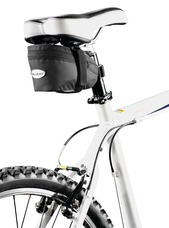 Frame triangle bag with shoulder pad for carrying the bike on your shoulder. With 3M reflectors, inside pocket. Klick´n Go mount for easy and perfect mounting. 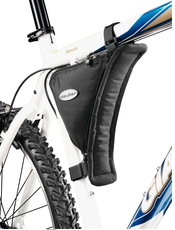 Expandable for extra storage space, compression strap. 3M reflector, attachment loop for the Safety Blink and air pump holder underneath. 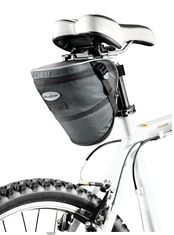 Small saddle bag with Klick´n Go mount for easy handling. Ideal size for tube, keys and small tools. Including 3M reflector and loop for the Safety Blink. Enough space to store a tube and additional tools. Easy mounting with velcro strap. Expandable for extra storage space. 3M reflector, loop for the Safety Blink and air pump holder underneath. 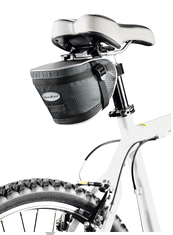 The small saddle bag for race cyclists and mountain bikers alike. 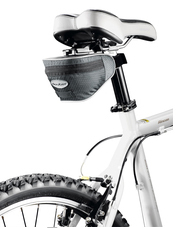 Easy and secure mounting to the saddle with the velcro strap. Ideal to hold tube, keys and small tools. Including 3M reflector and loop for the Safety Blink.